You will be picked up from your hotel in Paris in the early morning. Afterwards, you will leave from a location in the center of Paris at 7:15 am. Climb onboard an air-conditioned coach and cross through the neighbourhoods of western Paris until you reach the Normandy motorway. During the trip, your guide will explain the details of the tour and provide you with some initial commentary about the region. After around two hours, you will arrive in Rouen, the first stop of your excursion. Your guide will walk you through the historic center to discover, among other things, the impressive Rouen Cathedral. The city of Rouen is particularly charming thanks to its medieval alleyways, its lively pedestrian streets, its half-timbered houses and its famous Gros Horloge, an astronomical clock that is one of the city's treasures. Many Impressionist painters were inspired by the beauty of the city, including Claude Monet, who painted various views of the cathedral. Then head to Honfleur, approximately 90 km (56 miles) west of Rouen. During the ride, admire the view of the Pont de Normandie, a cable-stayed bridge that spans the Seine estuary. When you get to Honfleur, enjoy some free time to discover this port city with its picturesque streets and colourful houses which have preserved a rich historic and artistic heritage. Eat lunch on your own in one of Honfleur's restaurants, in a typical atmosphere. After lunch, the coach will take you to the Beaches of Normandy, which are must-see World War II sites, symbolic of the Allied landings in 1944. First discover the American military cemetery in Colleville-sur-Mer, which is impressive with its 70 ha surface area and length of one kilometre. After listening to commentary from the guide, take advantage of this visit to discover this site, symbolic of the Normandy Invasion, inland from Omaha Beach. If the weather permits, the coach may take you to Arromanches, around 25 minutes away. Immerse yourself in history as you visit this Normandy beach, where the remains of the pontoons of the 1944 landing have remained visible in spite of strong tides. The day will end in Caen where you will stay at Novotel Caen (or similar) and dine with the group at the hotel. After breakfast, take a seat on the coach, which will head to Saint-Malo (approximately 170 kilometres from Caen). Take advantage of a guided tour to discover this town in Brittany which boasts a rich historic heritage and several classified monuments: the city walls, the castle, Saint-Malo Cathedral, and Fort National. Enjoy some free time to eat lunch in the center of this historic city. 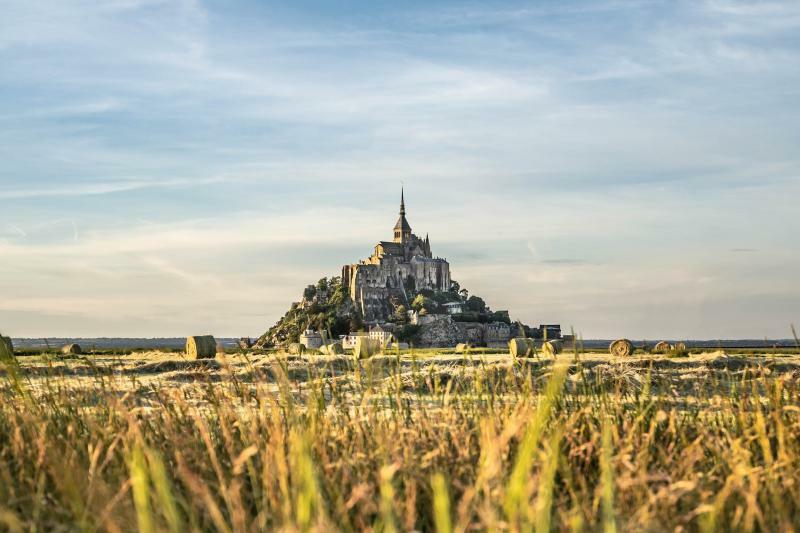 The tour will continue on with a visit of Mont Saint-Michel which marks the border between Normandy and Brittany. Discover this "Wonder of the West" perched on a rocky islet dating back to the Middle Ages, surrounded by a splendid bay. At the entrance, after going through the King's Gate, with its drawbridge, you will find the Grande Rue, or main street, where the main museums, shops and medieval houses are located. Follow the guide to climb the Grand Degré staircase. When you get to the top, visit the fascinating 8th-century Benedictine abbey. Admire its Gothic architecture and discover the cloister, dining hall and garden overlooking the sea. After the guided tour of the abbey, be amazed by the panoramic view before you as you walk along the town walls. Also, take advantage of this free time to enjoy a delicious crepe or buy some souvenirs. Departure time is around 4:30 pm from Mont Saint-Michel, for an expected return time in Paris of around 9:15 pm.